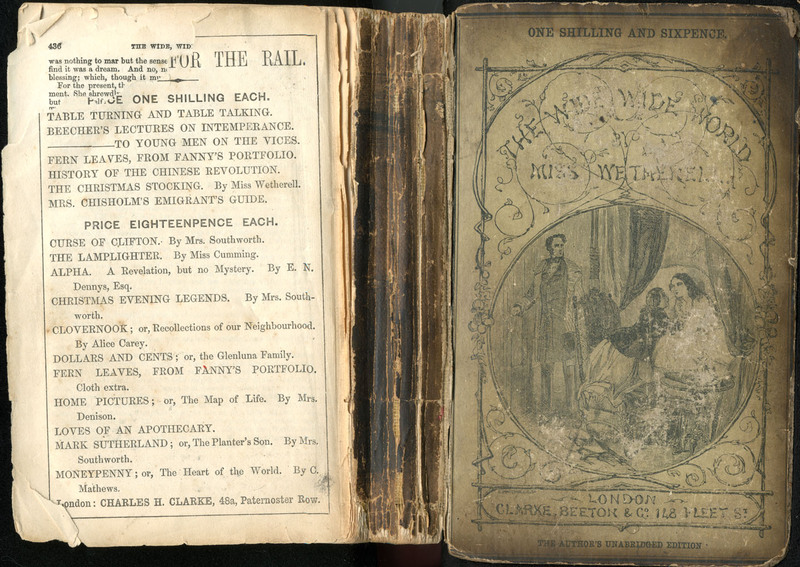 This is the full cover of the  Clarke, Beeton, & Co. reprint, version 1. The cover is faded and some of the title is illegible. At the top of the cover reads the price of the book while below the title is given amidst a framework of greenery which houses an illustration of Ellen, Ellen's Mother, and Ellen's father. Beneath the illustration is the publication city and publisher. The back cover is no longer attached to the book. This illustration, appearing on page 406a of the  S.W. 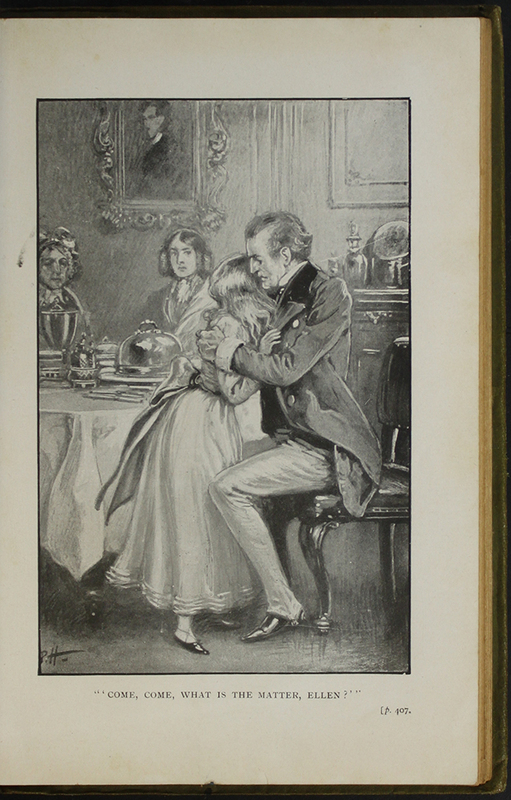 Partridge & Co., Ltd. edition, depicts Ellen being comforted by her Uncle Lindsay as her aunt, Lady Keith, and her grandmother watch from across the table. 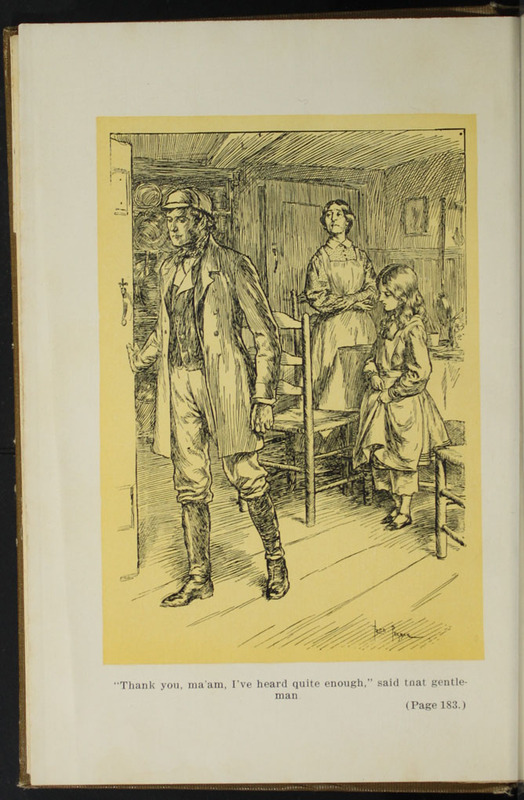 A caption below the illustration quotes a sentence from page 407 of the text and reads, "'Come, come, what is the matter Ellen?'" The room where Ellen and her Uncle Lindsay are pictured is very proper with a table strewn with silver tableware, a fireplace, and a large painting hanging on the wall. While Ellen's Uncle Lindsay seems eager to pull Ellen close to him to comfort her, Ellen, although leaning in, also appears to be resisting as she looks almost as though she could be pulling away from him. This ambiguity highlights the developing relationship between the two as Ellen loves her Uncle Lindsay but finds it difficult to conform to the demands he places on her. This is the illustration on page 230C of the 1853 H.G. Bohn Reprint, Version 1 Depicting the letter carrier arriving at the apple bee. The letter carrier stands in front of Aunt Fortune's opened door reaching in his bag for the letter. He is glancing down at Ellen who is standing in front of him in a white dress. Father Swaim stands to the right of the letter carrier leaning on his cane and holding a small horn in his left hand. Nancy is standing beside him, touching his arm. Aunt Fortune is standing behind Nancy holding a tea cup and saucer and frowning at the the letter carrier. An inscription below the illustration reads, "The Old Letter Carrier." This is the illustration on page 86c of the 1853 H.G. 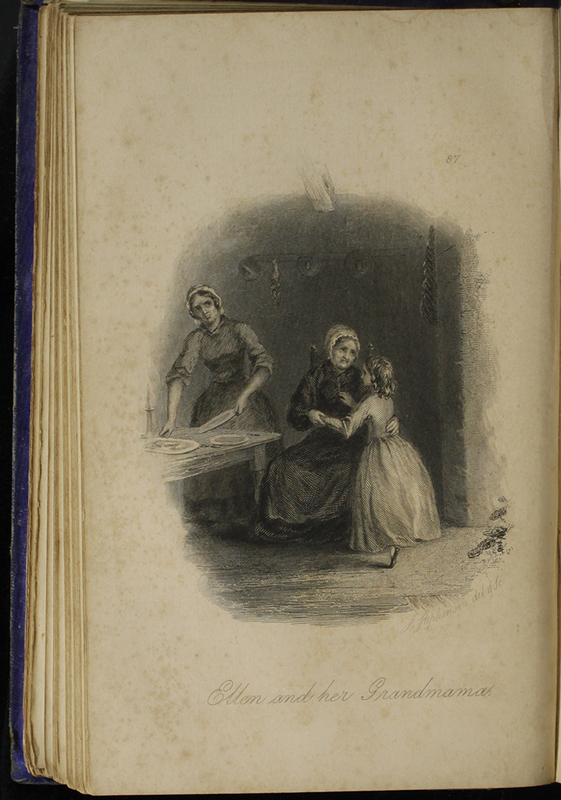 Bohn Reprint, Version 1 Depicting Ellen, Aunt Fortune, and Grandma in the kitchen. Grandma is sitting in a chair with her arms wrapped around Ellen, while Ellen is reaching for Grandma. Aunt Fortune is staring at them disapprovingly, as she cleans up the dishes. It is captioned, "Ellen and her Grandmama." 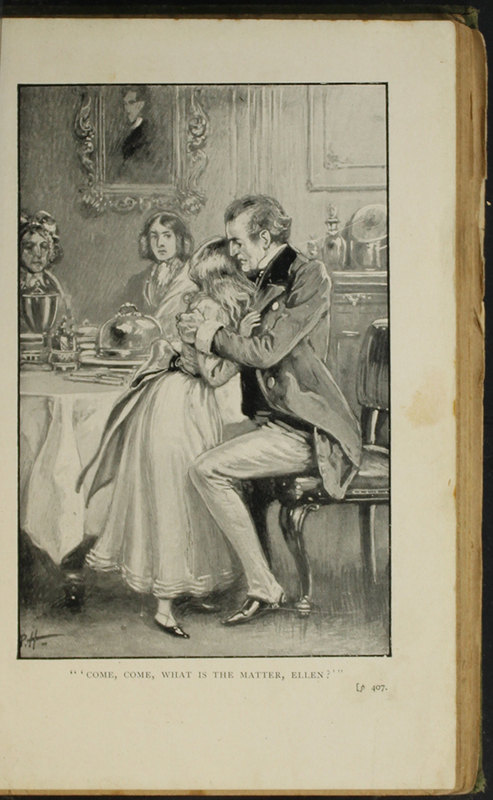 This black and white illustration, found on page 564a of the  Grosset & Dunlap reprint, depicts Ellen Reuniting with John in Scotland. In the illustration, Ellen is approaching John with open arms to embrace him. 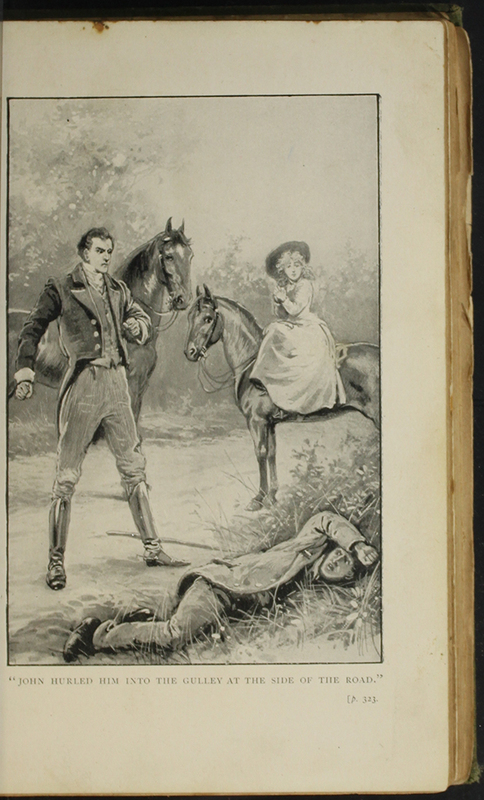 A caption below the illustration reads, "With a spring she reached him." The scene depicted is on page 564 of the novel. This black and white frontispiece, of the  Grosset & Dunlap reprint, depicts Mr. Van Brunt scolding Aunt Fortune for her treatment of Ellen. 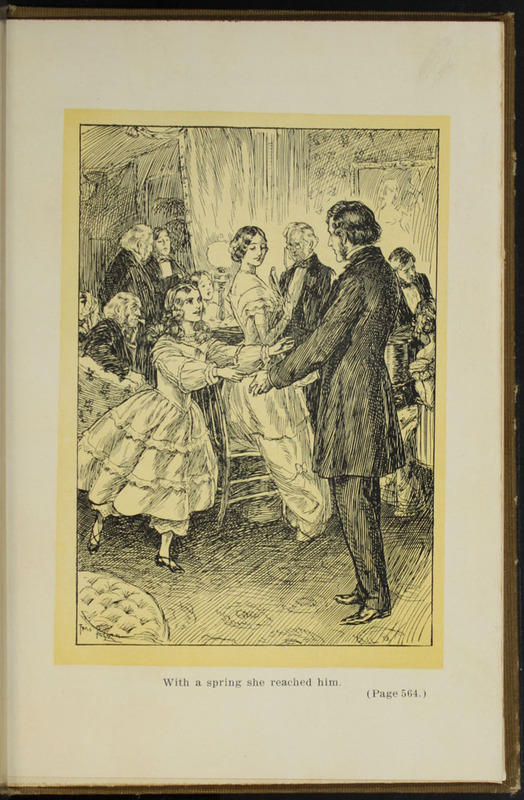 In the illustration, Mr. Van Brunt is walking out the door as Ellen looks down while clutching the skirt of her dress and Aunt Fortune watches him leave with crossed arms. 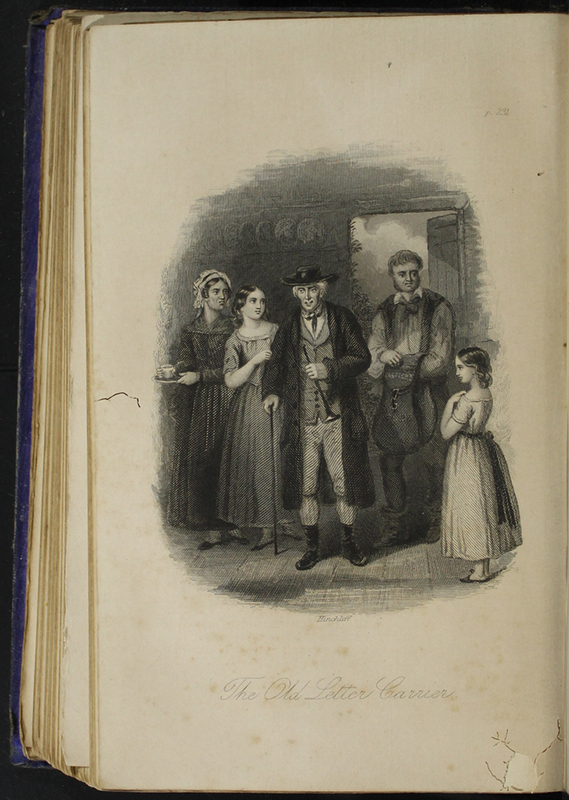 A caption below the illustration reads, "'Thank you, ma'am, I've heard enough," said that gentleman" The scene depicted in this illustration is on page 183 of the novel. 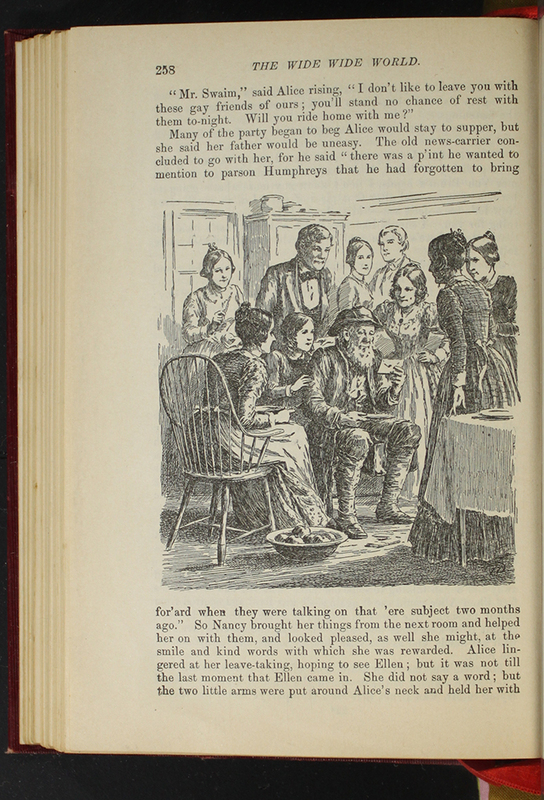 This full-color illustration, found on page 284b of the  Collins' Clear-Type Press reprint, depicts Ellen confronting the children playing at the Marshman's. In the illustration, Ellen is standing before the children with her arms behind her back. 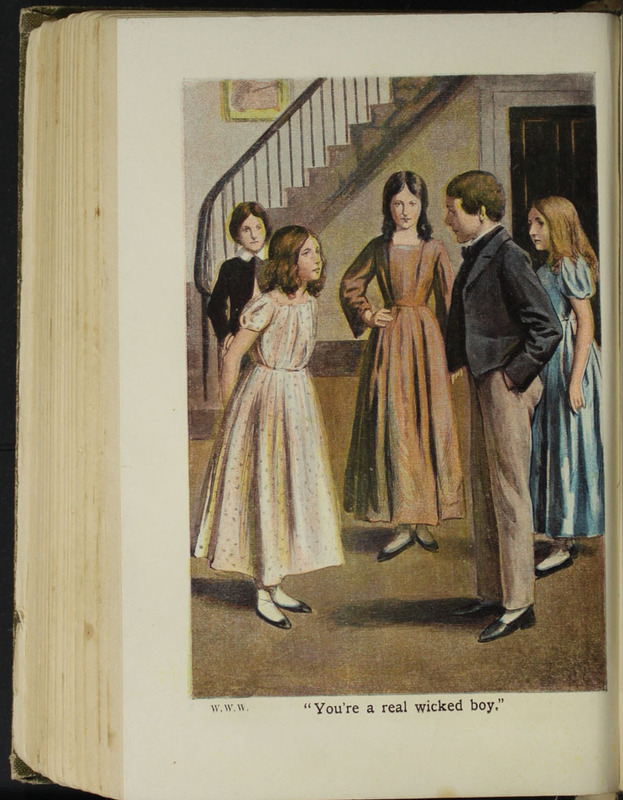 A caption below the illustration reads, "You're a real wicked boy." This black and white in text illustration appearing on page 258 of the 1903 J.B. Lippincott Co. "New Edition" Reprint, depicts the letter carrier appearing at the apple bee. In the illustration, Father Swaim sits in the middle of the crowd attending the apple bee, every one leaning in to look at the letter he is holding. Ellen sits to Father Swaim's right, lightly touching his arm and leaning in to look at the letter. Alice sits to Ellen's right in a chair, a bowl of apples sits next to her on the floor. Aunt Fortune is sanding to Father Swaim's left resting her hand on the back of his chair and looking the letter he is holding.